Having a local contact significantly reduces the stress, isolation, and difficulty faced by newcomers in their new and strange city. Welcome Groups can help families obtain essential items for their homes and offer guidance for navigating so much that is new: the health system, geography, transportation system, language, how to prepare for winter, and much more. We encourage you to review the information below before you apply to form a Welcome Group. When you are ready to form one, click the Form a Welcome Group button to begin the process. 1. What kinds of refugee claimant families do we help? All of our families are refugee claimants who have recently arrived in Canada. The families that we help are one of 4 vulnerable groups: single parents, pregnant women, families with children under 5, families with a disability, handicap, or reduced mobility due to age or health. 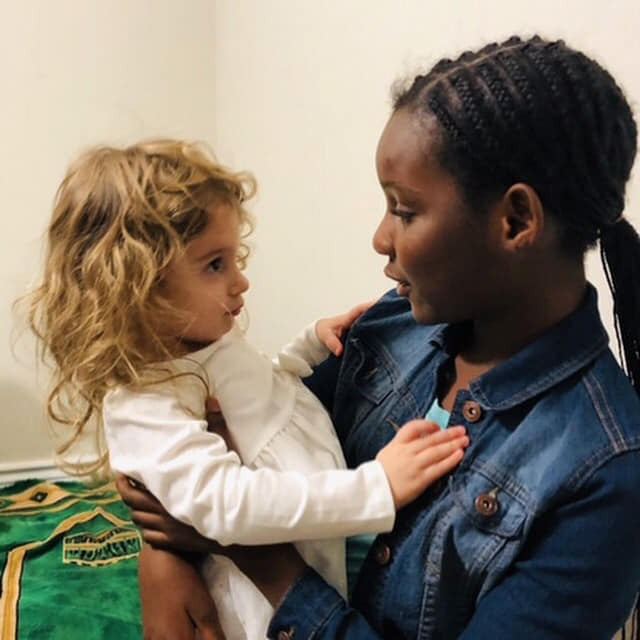 When we start working with the refugee claimant families, they are still staying at one of the shelters in Montreal that houses families when they first arrive in Canada, and are in the process of finding an apartment where they can live. All of our families are in the process of applying for their refugee status in Canada. 2. How do refugee claimant families get referred to the program? The refugee claimant families that we work with are referred to us by a social worker. The social worker assesses the families situation and vulnerability and refers families who have mobility barriers, language barriers, or other significant stressors that make it difficult for them to furnish their own apartments or locate items they need. 3. What kinds of refugee claimant families do we help? 4. How do refugee claimant families get referred to the program? 5. What is the role of a Welcome Group? Welcome Groups are a source of essential household items and local information, and friendly support during the first weeks in the refugee claimant families’ transition to Montreal. Welcome Groups help refugee claimants find the essential items they need to live and settle in the city. This means helping them source furniture, essential kitchen items and winter clothing. They may also help the family source school supplies and baby items if the new families have children. The group does this by reaching out to their own networks (family, friends, neighbours) to find essential household items that new families need to be able to live and function in their homes. They help orient the families in their new neighbourhoods. This may mean helping the family learn what resources are in their area (visiting a library, community center or local park). They may help the family access a local food bank, or find the closest CLSC. Some Welcome Groups help with occasional transportation for situations such as a hospital visit for a woman at the end of pregnancy or to a food bank. 6. What do Welcome Groups NOT do? The Welcome Groups do not provide legal, health or social services or take responsibility for the family’s individual situation. Welcome Collective is a short term support to help families get the essential items that they need and orient the families in their new city. Therefore, there is no requirement or expectation to remain in contact with the refugee claimant families beyond the 6-8 week period it takes to set the family up in their new home. A Welcome Group does not have to buy anything for the family or provide any financial support. Relationships between Welcome groups and a referred family can look very different from case to case. 7. What are the steps in the process of helping a family? Although there might be some small variations, as a Welcome Group you will go through the following 5 steps: Contact the family within 3 days of being matched to introduce yourself and validate the list of items they need. Reach out to your social network to ask for appropriate seasonal clothes, furniture and house items for the family. Contact us to let us know which items you might be able to get through your networks so that we can know which items you might not be able to get for the family. Arrange pick-ups and drop-offs at the family’s place. If you need help with picking up and dropping off large items you were given you can email donations@welcomecollective.org . Provide the family with some information on how to access basic resources in their neighbourhood. This means giving them the information for food banks and their nearby school if they have children. We will provide you with a list of resources in the family’s neighbourhood so that you can go over that list with the family. Welcome groups can contact Welcome Collective at any point of the process. We are here to support you. 8. How long will I have to gather the items that the family needs before they move into their new home? The length of time between when you are matched with a family and when they will need items for their new apartment varies depending on the date they move in to their new apartments. Sometimes you will have several weeks before a family finds an apartment and signs a lease. In other cases, a family may move into their apartment only a few days after you’ve been matched because they have and signed a lease for an apartment that is available immediately. When a family moves into their apartment sooner than expected, We are often able to help by delivering essential items that the family needs right away. In other cases, it may take a week or so to deliver them the items the need for their home. It is important to remember that for the family, without the help of Welcome Groups and the Welcome Collective, they may not have access to essential items. Knowing that they are in contact with someone who is actively looking for items on their behalf makes a huge difference to their sense of well being. Even if it takes a few weeks to locate a needed item, it is one less area of stress in their lives. 9 How many times will I be expected to see the family and what is the time commitment of this process? If you are volunteering as a Welcome Group, the time commitment is 6-8 weeks, but within that time frame, your contact with the family is dependant upon you and your schedule. Some Welcome Groups visit their family on weekends, some might arrange to help the family in the evening or during the week if they are free. The first 2 weeks after the family moves are usually the busiest. Staying in touch might involve texting, phone calls or in-person visits. It’s important that the family knows they can rely on you to get in touch, but it’s ok to be firm about your availabilities! The WeCo team will be on hand to help with any unexpected situations that come up. 10. When does this commitment end? How do I know that I am finished? Your commitment as a Welcome Group ends when the family has sufficient beds and bedding, winter clothing, a essential items for their kitchen, bedrooms and where possible their living room. Families should also know how to access basic resources (food banks and other relevant resources listed in their neighbourhood resource sheet that we provide to Welcome Groups). 11. Do I stay in touch with the family when my commitment is finished? 12. What happens if I don’t feel comfortable helping a family if I have already started the process? We do not want to put you or the newly arrived family in situations that you do not feel comfortable with or that you feel you can’t manage. If you decide that helping the family is not working, it is possible to end the relationship. We ask that you contact us quickly to let us know that you are no longer available so that we can make sure the family receives the support that they need. 13. I want to make a financial contribution towards a specific family. Is this possible? We cannot accept donations earmarked for a specific family. All donations to Welcome Collective are legally required to go toward the cost of programming, operations, and special events that are intended to benefit refugee claimant families. 14. I don’t have access to a car. Can I still be a welcome group? Yes. Although it may be more challenging, and requires more patience and planning, it is possible. Ideally at least one person in your group should have a driver’s licence and occasional access to a vehicle, but the most important thing is that you are providing your time, resources and support to a newly arrived family. 15. What kind of material and logistical support can a Welcome Group receive from Welcome Collective? The Welcome Collective’s mission is to help you support a refugee claimant family. This means that we are here to answer your questions, provide you with a list of community resources and help you navigate those resources. We can also help with logistical support that involves picking up and delivering large furniture items that you have found for a refugee claimant family (from the donor to the family) and help you find essential household items that you can’t find within your own networks. 16. What are the emotional challenges of becoming a Welcome Group? While helping a vulnerable refugee claimant family settle into their new home can be a rewarding and meaningful experience, it can also be emotionally challenging. The refugee claimant process takes many months, and the family may experience significant barriers (such as language, education, financial, or trauma from previous experiences) to becoming self sufficient and settled in their new homes. Sometimes, the challenge can come from personality conflicts or cultural differences between the Welcome Groups and Refugee claimants. This is why we stress to Welcome Groups starting the process of helping a family that a Welcome Group’s role is not to solve every issue that the newly arrived family will face. Rather, our goal is to make sure that the family has all of the essential household items and a basic orientation of the city’s resources and social services (we help you find these!). Having a friendly face and a listening ear is also a major asset to new families who are coming to a country where they may have few other connections, community or resources. The Welcome Collective team is here to answer the questions that come up for you as you go through the process of helping a family. We are also here to respond to concerns that come up for you about your role and your responsibilities. We try to answer all questions that are asked as soon as possible, but commit to answering your question within a 24 hour period. 17. How many people can form a Welcome Group? A Welcome Group can be a family, a group of friends, or a few colleagues. There have been cases where one individual forms a Welcome Group, but we advise you to find a friend or a family member to help out as it is good to have support to share the emotional and physical work that is involved. No matter how many people involved, however, it is important that one person take the role as the main contact between the Welcome Group and the Welcome Collective. Some of our successful Welcome Groups have been been students, couples with young children, retirees, and coworkers! 18. I am a health or social service professional (for ex. a social worker, a psychologist, a clinical counselor, etc. ), can I be a Welcome Group that also provides free professional help to refugee claimant families? No. While we are very happy to have Welcome Groups that have a professional background in health or social services, we find it is important that the relationship retains its boundaries. The help provided by a Welcome Groups should be casual and friendly in nature. If you would also like to get involved in another capacity, we welcome volunteers with skills in a variety of areas. Please contact us at benevoles@welcomecollective.org. 19. I only have free time after work hours and during weekends. Can I contact Welcome Collective at these times or do you only work from 9am to 5pm during the week? We encourage you to contact us as much as possible from 9am to 5pm during the week. However, we are available on evenings and weekends for emergencies. If there is an urgent question or concern that comes up, please feel free to contact us. We want the Welcome Groups and our referred families to feel supported during this process. 20. I have signed up on the form but I don’t feel ready to take on the full responsibility of helping a family settle into their new apartment. What should I do? Helping a refugee claimant family settle takes energy and time for 6 to 8 weeks. We suggest that you only take on a family when you feel ready. In the comments section of the form, feel free to give us any details of your particular situation and when you think you are ready to help. If you want to be matched but need more time to prepare, or have any other questions or concerns, you can let us know. We will only match you when you feel completely ready to start. 21. I am a former Welcome Group, is there a way to make suggestions to improve the process? Yes! We always want to hear from our former and current Welcome Groups. If you have any problems with our processes, suggestions or complaints, please let us know. You can write the executive director at noelle@welomecollective.org.